Have you ever heard of someone being afraid of reviewing a children's book? For the first time - Read Aloud Dad is on the verge of a panic attack. I am sincerely terrified of not being able to convey how unique and perfect this book is. I'm panic-stricken that I will not be able to tell you how gentle, humane and compassionate are the stories and how superbly illustrated they are. These stories are not mere literacy building tools. Oh, no! 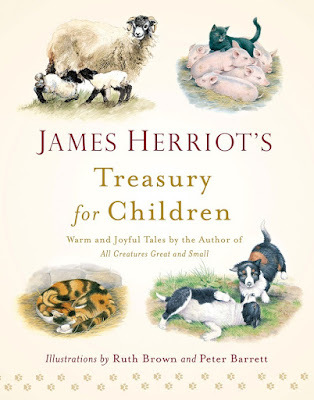 James Herriot's Treasury for Children: Warm and Joyful Tales by the author of All Creatures Great and Small is chock full of character-building, emotional stories that are certain to leave a deep imprint on the souls of its young listeners. But books like these are associated with a special type of problem. There is one thing that I must not tell you - namely, this is the third straight day that I am writing this review - and I'm still at the very beginning. And that is a simply measure of how much Read Aloud Dad loves this book. It was suppertime, some six months ago when James Herriot`s Treasury for Children arrived in our house. No, wait - just checked it out in my "orders history" - it was 17 Sep 2010. Nine months ago, when my twins were 3 years and 2 months old. I was afraid this book would be way over their head. My wife was SURE it was way over their head. But, I wanted to try, as I suspected that the massive full color illustrations on every page could do the trick. So I walked down the steps with the treasury under my arm, as cool as possible. My kids were sitting around their little round and green plastic table - my daughter on her favorite blue chair and my son on his favorite pink one - and as soon as they saw the cover of my book, they knew something was up. OK, admittedly, they are always open to a new book. But when I opened the first page to start reading Moses the Kitten - the first of the eight picture book stories contained in the treasury - my kids dropped everything else that they were doing. There was a silence in the room - (that I fondly remember to this day). You could almost hear their jaws drop. We read the first story from beginning to end without a pause, even though I don't think they understood half of the words. As I was reading, I thought - that's it, this book goes back on the shelf for another year. Yet, as soon as we finished reading Moses The Kitten, my little pumpkins wanted the story again and again that very same evening! Now - that we have read all the stories in the treasury - be assured that all of Herriot's animal yarns are equally captivating and exciting. What is more, Moses the Kitten (the first story) is a bit more verbose than the others and could give you a wrong impression of the entire treasury's language complexity. So feel to start the treasury with any story and come back to Moses later. Aside this treasury, have you read any other books by James Herriot? If the answer is yes, then let me asure you this treasury does not stray away from his spell-binding story-telling style - yet they are adapted and lavishly illustrated for children. If the answer is no, you will be heartened to know that these story are not only entrancing, but the illustrations are also so powerful that you can include very young listeners in the read-aloud sessions and they will not be bored. Herriot is a country vet who depicts the most colorful events from his practice in language that will keep you and your listener riveted to your seats. This is not simply a book about animal life in the English countryside. This is a book about the people, relationships, local customs and real life and death situations. The heroes of the book are animals ... can you find more genuine heroes anywhere? When they hurt - they hurt. When they are sick - they cannot hide it. There are no hypochondriac cows, neurotic kittens or valetudinarian puppies in this treasury. This is a book about raw, live emotions. This is a book about real life. You may be wondering about the author? In fact there is no "real" James Herriot. It is simply the pen name of James Alfred Wight, an English veterinary surgeon and writer. Wight - or Herriot- is best world famous for partly autobiographical stories, that have been published in several volumes. 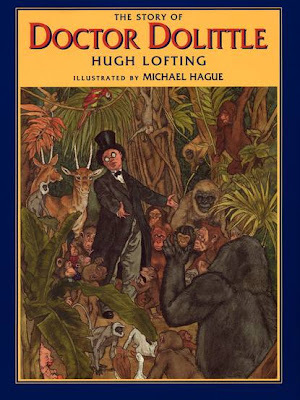 Herriot's "adult" stories - not the treasury we are reviewing here - are great stories for "adults", but which you will also be able to share with your kids as fantastic read-aloud material as your kids grow older. His most famous omnibus editions (I hope to add them to our home library one day) are: All Creatures Great and Small, All Things Bright and Beautiful and All Things Wise and Wonderful. 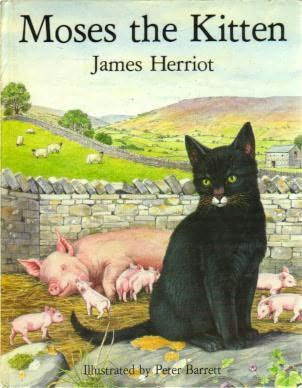 The eight stories that can be found in the James Herriot`s Treasury for Children are stories that Herriot wrote specifically for children based on his experiences as a farm animal vet. They were published as separate picture books and then later joined together in this treasury. The illustrations by Ruth Brown and Peter Barrett are so similar in style and quality that it will never cross your mind that this treasury was ever a handful of separate stories. Two sheepdog puppies - Gyp and Sweep - are inseparable. "There's one odd thing about Gyp, Mr Wilkin said. "He's never barked at all". One day, Gyp lets out a bark... and never again. Dog-lover Mrs Pickering and her basset-hounds receive surprise visits from a little tabby cat named Debbie. After her short visits, Debbie always leaves. One Christmas, Debbie returns very sick with a tiny kitten. Farmer John Skipton retires his two old carthorses and gives them a life of joy and freedom, out of pure love for the animals. The vet convinces the farmer decides to enter the Family Pet show at the local Darrowby Show with one of the horses and ... guess who wins! Old Blossom, no longer gives sufficient milk and Farmer Dakin decides to sell her away. Yet, the cow doesn't share a desire to abandon its barn and it returns running back to the farm. Will Farmer Dakin keep her now or give her away again? A frightened dog begs for food at the market square. Three months later, the dog is found hurt after a hit-and-run. After recovering in the police kennels, no one comes to claim it. Will the market square dog find a new owner? Smudge was a curious little lamb. He simply had to find out what was on the other side of the fence. One day, Smudge finds a hole big enough to creep out of the field, but after a walk outside, he cannot return back to his mom. Smudge barely survives the cold and is reunited with his sheep family. Faith is taking the first step even when you don't see the whole staircase.Martin Luther King, Jr.
James Herriot`s Treasury for Children, for kids it is mostly a book about learning, laughter and hope. As kids mature, they will enjoy different aspects of the same tales. At their very core, the stories are tales about humanity and compassion. You could still miss out on James Herriot`s Treasury for Children just because Read Aloud Dad may not be eloquent enough. So if I have not convinced you yet, take a leap of faith. Read Aloud Dad assures you that this book will be as fresh when you read it for the 100th time - as it was the first time that you opened it. For me James Herriot`s Treasury for Children was worth every penny ... ten times over. Thanks for your comment - I've received so much great feedback about Herriot's books over the past two days! I don't remember reading them as a child/teen - but now I am officially hooked. When I start reading All Creatures Great and Small - I'll promise to look out for the story about Tricky Woo! I devoured Herriot's books in high school. Still remember Tricky Woo. What a beautiful present for your dad who must have enjoyed James Herriot's stories so much! And now that I know you even visited many of the places, well ... Read Aloud Dad is officially jealous! Thanks for your kind words - these days my amazing readers like yourself are giving me so much inspiration. As you rightly say ... "It is never too early to start!" What a great review of these wonderful stories. I love James Herriot and have read all his books as well as gave them as gifts to my Dad, a farmer in the Canadian prairies. He enjoyed reading about the similarities between farming in rural Engalnd and Canada. My husband is from Yorkshire so we have visited many of the places mentioned in these books. Your twins are lucky indeed to have a Dad who reads such wonderful books to them. It is never too early to start! 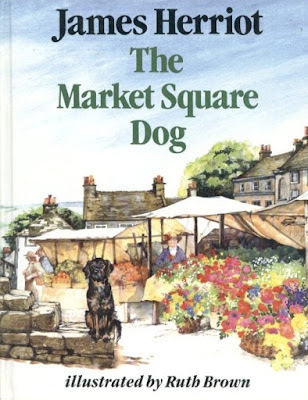 Your story of how you swiped Herriot's other books from your Dad's bookshelf just prompted me to add James Herriot's "adult" books to my "to buy" list. Although I loved the children's treasury, I still hadn't received word about these other books from someone who had read them in person. Thanks so much, the mental image of my twins "swiping them off my bookshelf" is so powerful ... I can't wait for the day! And when they grow up - they'll be able to read in this blog that we have those remaining Herriot books - thanks to you! Thanks for sharing, I truly learn a lot from comments like yours. As luck would have it, we have this book--in fact, a lovely hardbound copy. I must have bought it at a thrift store years ago. It's been tucked away on a shelf and forgotten. I'm thrilled to pull it off the shelf, dust it off, and read it to my kids. In fact, I just set it out for today's reading. Thanks for the enthusiastic review that has prompted me to find this forgotten gem! Glad to help! :) And here I thought I was just enjoying the memory of something that hasn't crossed my mind in years, lol. Wow, your six-year old is already reading (listening to) the adult Herriot books! I love your post and it testifies to the importance of reading aloud. Let me quote it briefly:"N.'s immersion in James Herriot's Yorkshire in the 1940s has been just as valuable as his more formal learning. Of course there's vocabulary; N. used "subcutaneous" in a sentence the other day, and we all learned that the term "husky voice" comes from the raspy cough that animals get when afflicted with "husk." Simply fabulous! PS: Herriot is a true master of words. I bought his adult books as a present to my mom - and she simply adores them.